Accelerating, stopping and sharply turning require traction between your shoe’s soles and the court. Covering the surface of a basketball court is a slurry of friction-reducing debris including dust, dirt and clothing fibers. As this debris collects on the bottom of your shoes, it creates a film that can lead to a loss of control, with a possible painful result. Avoiding accidents like falling to the court’s surface, or colliding with another player or an inanimate object, requires maintaining traction while you play the game. Wipe down the soles of your shoes with a clean towel. 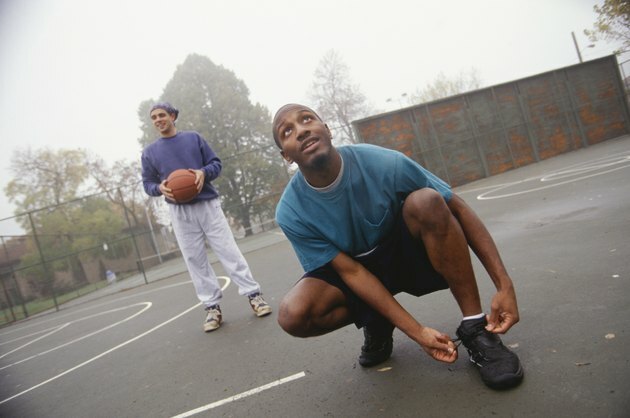 Clean your shoes every timeout or break to increase traction. Always use a clean portion of the towel, to avoid wiping dirt back on your soles. Apply a liquid grip enhancer to the soles of your shoes. The application of grip enhancers varies by manufacturer. Most come in a plastic bottle and either have an attached foam roller that dispenses the fluid on the bottom of your shoes or a dabbing brush that dispenses a small amount of enhancer; others have no applicator included and require moistening a towel with the product. Allow the enhancer to dry, if required, before heading back to the court. Set a stick mat on the court, between your bench and the court’s out-of-bound markings. Keep the non-secured end of the mat sheets facing the court. Step on the mat with both feet before crossing the court markings. Peel the top layer away from the mat’s surface, when you see no clean area remaining on its surface. You will see dull areas on the mat as it pulls debris from the bottoms of your shoes. Certain grip enhancers leave a dirt-collecting film on the bottom of your shoes; avoid these types of enhancers, if you see a tough layer of debris on your soles.